The Golf Club of Estrella, a course designed by Jack Nicklaus II in Goodyear, Arizona, was named No. 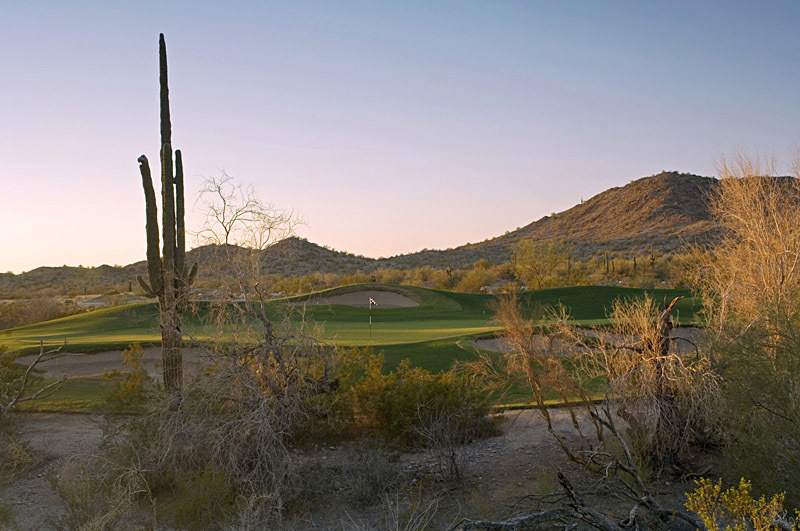 23 on GolfAdvisor’s list of the Top 25 courses in Arizona for 2014. Golfers reviewed their experience year round, not just in primetime. The Golf Club of Estrella managed a consistently exceptional experience as rated by no fewer than 20 vacationers and locals. Arizona is a competitive state for golf, particularly in Phoenix-Scottsdale, where there are some 200 courses to choose from in all shapes and sizes. Also unique to most of Arizona is that the experience is incredibly dynamic from season to season. From January through April, courses are expected to be in prime condition for snowbirds, and greens fees are at their peak. In the summertime, courses transition back to Bermuda grass and do their best to keep the grass alive while also dropping rates to lure golfers willing to endure 18 holes in 110-degree heat. In the fall shoulder season, courses often close for weeks to overseed and then grapple with the challenge of both growing new rye grass and keeping golfers happy, with wet fairways, cart path-only and all. The Golf Club at Estrella features fairways that roll across the natural contours of the land, while elevated tees unveil views of the Sierra Estrella Mountains. It is a course as remarkable as its heritage. In keeping with the philosophy of Nicklaus Design, the course blends in with its environs and incorporates natural desert vegetation. In 2014, the course was also included in Golfweek’s lists of the Best Residential Courses and Best State-by-State Courses You Can Play. Golf Magazine named the course to its 2014 list of The Best Courses Near You and its 2012 list of the Best Public Courses by State.